Editor’s note: We are delighted to welcome the new book Nature’s Prophet by science historian Michael Flannery with a series of excerpts. Professor Flannery is a Fellow with Discovery Institute’s Center for Science & Culture. Nature’s Prophet is currently on sale here for $26, a substantial saving from the list price of $44.95. But was Wallace a “crazy” crank? Was Wallace an undisciplined “dilettante” bemused by every fringe belief he encountered? These dubious distinctions undoubtedly stem from his interest in such heterodox ideas as phrenology, spiritualism, socialism, land nationalization, opposition to vaccination, and women’s liberation. While some of these commitments can be seen inchoately early on in Wallace’s life, most become overtly clarified in his later years. My book, however, seeks to put these dismissive views of Wallace to the test by seriously investigating Wallace’s interests in such unorthodox — even unpopular and heretical — ideas in some detail. All of them emanate from his concepts of nature, human nature, evolution, and worlds seen and unseen. As such, my book is not a biography; it is an intellectual history of Wallace’s independent thinking on the conjunctions and ramifications of evolution to the human condition, to the nature of the world and cosmos, and its theological implications. Others have gone before in this effort to examine Wallace’s beliefs, but most have only dealt with a particular aspect such as his commitments to various causes and philosophies, and where more comprehensive treatments have been offered, little unanimity exists on the nature of Wallace’s views on these issues or even the paths and influences by which he came to acquire them. Of these, however, the best is Martin Fichman’s An Elusive Victorian. Fichman understands that Wallace’s later works and ideas “were not the eccentric musings of a declining mind but powerful syntheses of late-nineteenth/early twentieth-century intellectual currents. They incorporated and influenced the thoughts and activities of members of elite and popular cultures on both sides of the Atlantic.” Yet even Fichman, who sees Wallace and his American colleague William James (1842-1910) in a similar light, considers such unorthodox figures as “elusive” because “their wide-ranging thoughts and activities defied neat categorization.” My book suggests otherwise. Wallace, as much as James, can be categorized broadly as an adamant opponent of scientism, most broadly defined as the view that science and its methods are all-sufficient in describing and explaining everything from human behavior to cosmic reality. A few words of explanation are in order here. In Wallace’s day this would have been known as scientific materialism, famously (for some infamously) explicated by John Tyndall (1820-1893). Tyndall unquestionably believed in the primacy of science. While he acknowledged the areas of sentiment, morality, values, and religion, he relegated them into decidedly subordinate epistemological roles. Today we would view Tyndall’s scientific materialism as a form of ontological scientism, what Mark Stenmark has described as the more ambitious view “that the only reality that exists is the one science has access to.” John Duprétly described it as a kind of “metascientific essentialism.” Tyndall exemplified these ideas, including a tendency of leading science towards boundary transgression into philosophical and metaphysical realms. Rather than contrasting Wallace with Tyndall’s scientism, it might be more instructive to see him more positively as a theistic pluralist closely allied to the ideas of John Elof Boodin (1869-1950). Although there is no indication that Boodin was influenced by Wallace in any way or conversely that Wallace was aware of Boodin, Boodin’s “manifest propensity for speculative daring,” his clear call for a reintroduction of teleology into our understanding of the natural world and evolution in particular, his pragmatic pluralism (rejecting reductionist monism and Cartesian dualism), and his conceptualization of God in terms of “personality, creative intelligence, creative beauty, creative goodness, and creative love,” all coincide rather compellingly with Wallace. Science was vitally important to both men, but more as a means of creative orchestration rather than a mandated prescription. It has been said that “Boodin had sought to accomplish . . . the synthesis of pragmatic methods in theory of knowledge, with empirical scientific results and procedures, to produce a systematic, synoptic metaphysics in which human life is both understood and idealized.” Wallace’s project was quite similar and no less ambitious. There were — and are — others with a Wallacean vision. This contextualization of Wallace’s intellectual life needs to be seen as a journey in stark contrast with his more famous associate, Charles Darwin. While Darwin’s journey has been described as one from natural theology to natural selection, Wallace’s might be regarded as one from natural selection to natural theology. Herein lays Wallace’s “crime” — an offense against the zeitgeist of a new emergent era of modern thought ushered in by Darwinian evolution, one that rejected creationism and natural theology, anthropocentrism, Platonic essentialism, and teleology. In one way or another Wallace embraced all of these, and he paid a professional price for it. Many of Wallace’s detractors (then and now), believing that science is defined by the law-like operations of the physical world it observes and measures, have argued that it must perforce be governed by methodological naturalism (i.e., the notion that scientists must invoke only natural processes via unbroken natural laws in nonteleological ways). But, as we shall see, it was by no means clear to Wallace (or many of his colleagues) that a natural law resided strictly in the empirical world of normal experience forming a sharp epistemic boundary. To them, methodological naturalism became the operative companion not to scientific practice but to philosophical positivism, the belief increasingly common among nineteenth-century men of science who viewed the scientific project as the discovery and elucidation of laws operating through purely natural or secondary causes primarily using mechanistic or materialistic causes to the exclusion of any and all supernatural and/or teleological factors. Many have long known that Darwin’s theory expressed “an ideology of positivism” that had its own “implicit metaphysics . . . that all events are part of an inviolable web of natural, even material, causation.” This should not be surprising since the influence of David Hume (1711-1776) and Auguste Comte (1798-1857) on the thought of Darwin has long been known. Thus, the central question underlying Wallace’s apostasy from Darwinian evolution was in many ways not scientific at all, but rather philosophical and metaphysical. One need not go to Christian theologians to find critiques of the positivistic materialism implicit in Darwin’s theory. The philosopher-sociologist Max Horkheimer (1895-1973) questioned materialism for “trying to explain everything spiritual, and especially consciousness and reason, as pure illusion (in contradiction to the most instinctive thrust of reason itself) or as trying to derive the spiritual from material process with the aid of artificial hypotheses and questionable appeals to future scientific discovery.” He attacked Darwinism for its diminution of reason in subservience to the operations of natural selection and its running “roughshod over the ‘useless spiritual.’” Indeed the assumptions embodied in Darwinian and neo-Darwinian accounts of nature and especially of the unique nature of humanity have been questioned since they were first proposed more than 150 years ago. Even while Darwin continued to push his pen at Down House, complaints could be heard. One French correspondent, for example, exclaimed, “Will there not be found in British science a man of eminence to fight the battle of good sense and of the facts, against the monstrous imagination of Darwin?” There were. Men like William Whewell (1794-1866), John Herschel (1792-1871), and St. George Mivart (1827-1900) all had their own complaints against the theory. It is a fascinating irony that Wallace, who defended Darwin against all of them, ultimately stepped up to answer the Frenchman Paul Janet’s plea himself. But was Wallace a Darwinian? It surely wasn’t the concept of what was then known as “transmutation” or evolution that formed the dividing line for these men. Mivart was not only a proponent of the idea, more so than Whewell or Herschel’s special creationism, but also so was Darwin’s close confidant and advisor Charles Lyell, who held a more nuanced view that evolution occurred gradually over time but required some larger force beyond to make it work. So it surely was not the mere concept of evolution that formed a distinct intellectual boundary. Doren Recker’s question — How do we recognize a Darwinian? — is an important one. There are probably two main factors: 1) a commonly held constellation of beliefs, and 2) sociological factors. Both are fluid and malleable. For example, Asa Gray (1810-1888) always rejected Darwin’s belief that his theory rendered God perhaps not absent but surely superfluous to the process; instead, he loudly touted Darwinian theory in America, but recast it in a theistic form. Thus, Gray could be seen as a Darwinian in spite of his insistent theism largely for the very public promotional boost he gave to the theory. With Gray the weight of the sociological impetus he offered for Darwinian evolution counters any theistic amendments he may have gratuitously added on his own. He was, taken altogether, a Darwinian theist. On the opposite side of the coin Mivart may be excluded as a Darwinian. Here again social context matters, although for different reasons. Mivart had similar religious leanings to Gray, and in some ways Mivart seemed to understand and appreciate certain aspects of Darwinian theory even better than Gray, but his savage public attack on Darwin’s Origin of Species and Descent of Man preclude his admission into Darwin’s camp then and now. Wallace is a more complex case. Wallace certainly defended natural selection, and his book Darwinism: An Exposition of the Theory of Natural Selection with Some of Its Applications (1889) would suggest that he considered himself a Darwinian or at least sufficiently associated with Darwinian evolution to serve as its spokesman after its namesake’s death. In fact, at one point Wallace insisted, “I have always advocated [natural selection] unreservedly; while in extending this principle to almost every kind and degree of coloration, and in maintaining the power of natural selection to increase the infertility of hybrid unions, I have considerably extended its range. Hence it is that some of my critics declare that I am more Darwinian than Darwin himself, and in this, I admit, they are not far wrong.” But Wallace had other ideas about Darwinism, and such a statement needs to be taken in context with his other views, most notably the overall limitations Wallace placed upon natural selection in explaining certain aspects of nature (the origin of life and consciousness), the special attributes of humans, and in natural selection as a force in the elimination of the unfit. When, in the April 1869 issue of the Quarterly Review, Wallace called upon “an Overruling Intelligence to explain the special moral and mental attributes of man,” the split between the two naturalists was open and irrevocable. They were too gentlemanly and fair-minded to let it destroy their friendship, but it was clear to all that Wallace’s intellectual trajectory was away from Darwin not toward him. 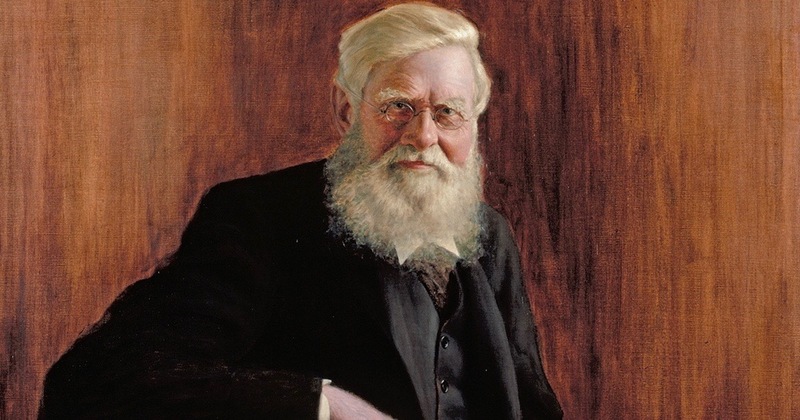 For all of Wallace’s vocal support of Darwin’s Origin of Species and natural selection in general he was considered an “outsider” by Darwin’s inner circle, the X Club led by his “bulldog defender” Thomas Henry Huxley (1825-1895). Wallace, whose defection would not be forgiven, and Lyell, who persistently called for some higher power at work in evolution, were not on the club’s invitation list. In spite of Wallace’s status as co-discoverer of the theory of natural selection and his outwardly congenial relationship with Darwin, his call for some higher intelligence in explaining humankind was heresy to the Darwinian faithful. Huxley revealed the ideological nature of his campaign for Darwin with unusual frankness when he privately told Mivart, “One cannot go on running with the hare and hunting with the hounds.” Huxley’s “hounds” were not pursuing the “hare” of evolution as such — were that the case Mivart would have not been in such conflict — they were pursuing the “hare” of creationism or anything that even hinted at higher teleological explanation. In that sense Wallace always would share more with Mivart than Huxley. His own persistent embrace of the term notwithstanding, Wallace cannot be considered a Darwinian. My book explains why. Image: Alfred Russel Wallace, attributed to John William Beaufort (1864-1943) [Public domain], via Wikimedia Commons.